US President George Bush has said former Iraqi ruler Saddam Hussein - now in US custody - will "face the justice he denied to millions". 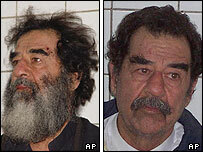 "His capture was crucial to the rise of a free Iraq", Mr Bush said in a televised address to the nation. US forces found Saddam Hussein on Saturday, hiding in a tiny cellar at a farmhouse about 15km (10 miles) from his home town Tikrit. He was described as co-operative after his capture and talking politely. But members of Iraq's Governing Council said the former dictator showed no remorse when he was brought before them for further identification in Baghdad. Council member Adnan Pachachi said: "We found him obviously tired and haggard but he was unrepentant and even defiant. He told us he was a just and firm ruler." Speaking from the White House, President Bush said "a dark and painful era is over" for Iraqis. "A hopeful day has arrived. All Iraqis can now come together and reject violence and build a new Iraq." But he warned that it "does not mean the end of violence in Iraq" and "terrorists... would rather go on killing the innocent". A powerful explosion rocked central Baghdad just after Mr Bush's speech. Witnesses and police said the blast in Baghdad's Karrada district on Sunday evening had been caused by fuel canisters on a truck - and there were no immediate reports of injuries. Saddam Hussein, 66, was the most wanted man on the list issued by US authorities, but had not been seen since Baghdad fell to US forces in April. The US has released video footage showing a dishevelled-looking Saddam with a long black and grey beard in custody receiving a medical check-up. A US military spokesman, Major-General Raymond Odierno, said the operation - involving various combined US units - was launched within 24 hours of receiving a tip-off from a member of Saddam Hussein's clan. "Over the last 10 days we brought in about five to 10 members of these families, and finally got the ultimate information from one of these individuals", he said. Two unidentified people said to be "close allies" of Saddam Hussein arrested and weapons and more than $750,000 cash confiscated. 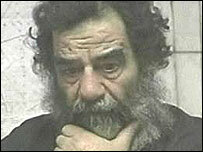 Saddam Hussein emerged from his hiding place "very much bewildered" and said "hardly anything at first", according to Major-General Odierno. The hut where he was living had two very small rooms. There was a bedroom cluttered with clothes, some of them new and still in their wrappers, and a kitchen with running water. The US-based group Human Rights Watch welcomed the Iraqi dictator's capture, but urged the authorities in Iraq not to mount a show trial and said international legal experts must be involved. BBC News Online's world affairs correspondent Paul Reynolds says that suddenly things are looking brighter for the coalition in Iraq, as Saddam Hussein's spirit had hung over the Iraqi people like a ghost. "Ladies and gentlemen, we got him", announced the US chief administrator in Iraq, Paul Bremer. "The tyrant is a prisoner", he told assembled reporters, soldiers and coalition officials, who burst into applause. Iraqis celebrated his capture in Baghdad and the northern city of Kirkuk by sounding their horns and firing into the air. The former Iraqi leader had last been seen in television footage shot in April at a Baghdad market just before the city fell to US forces in the recent Iraq conflict. US authorities had offered a $25m reward for information leading to his capture - and had been taunted by a series of audiotaped messages to Iraqis purportedly from the ousted dictator. Saddam Hussein's former deputy, Izzat Ibrahim al-Douri is now Iraq's most wanted. The US has put a $10m prize on his head, accusing him of co-ordinating some of the attacks on US forces. Saddam Hussein was born in Tikrit and his tight network of family and clan ties permeated all of the regime's main military, security and political institutions. Coalition authorities have said that the former Iraqi president could be tried at a war crimes tribunal, with Iraqi judges presiding and international legal experts acting as advisers. The capture of Saddam has overshadowed the latest violence in Iraq, in which at least 17 people were killed and 30 wounded when a powerful car bomb exploded at an Iraqi police station in Khaldiyah, about 35 miles (60 km) west of Baghdad. US officials say it may have been a suicide attack. Later, a US soldier died while trying to neutralise a roadside bomb south of Baghdad. President Bush heard the news of Saddam's capture first from Defence Secretary Donald Rumsfeld at about 2015 GMT on Saturday. The White House spokesman said Mr Bush interrupted Mr Rumsfeld's first words - "Mr President, the first reports are not always accurate," to say, "This sounds like it's going to be good news". Mr Rumsfeld told him the military believed it had captured Saddam. "That is good news," Mr Bush replied. Mr Bush hurried back to the White House from the presidential retreat at Camp David and was kept informed about the process of verifying Saddam Hussein's identity. Final confirmation of the capture was passed on by US National Security Adviser Condoleezza Rice early on Sunday. "Under arrest the deposed dictator is meek and obedient"